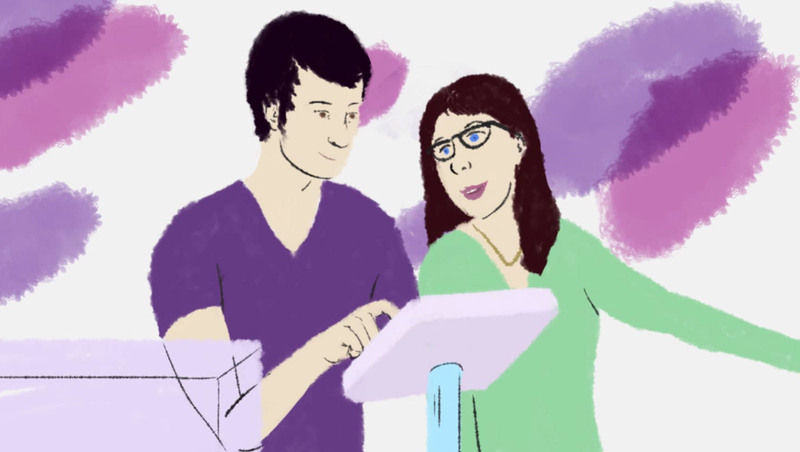 Bringing together the online and in-store experiences. Today’s bridal customers are overwhelmingly Millennials—they’ve grown up with technology and social media and use it often and with ease. As a generation, they’re much less influenced by traditional forms of advertising such as television commercials, and are more likely than the generations preceding them to orient their lives around personal devices and to do their shopping online. 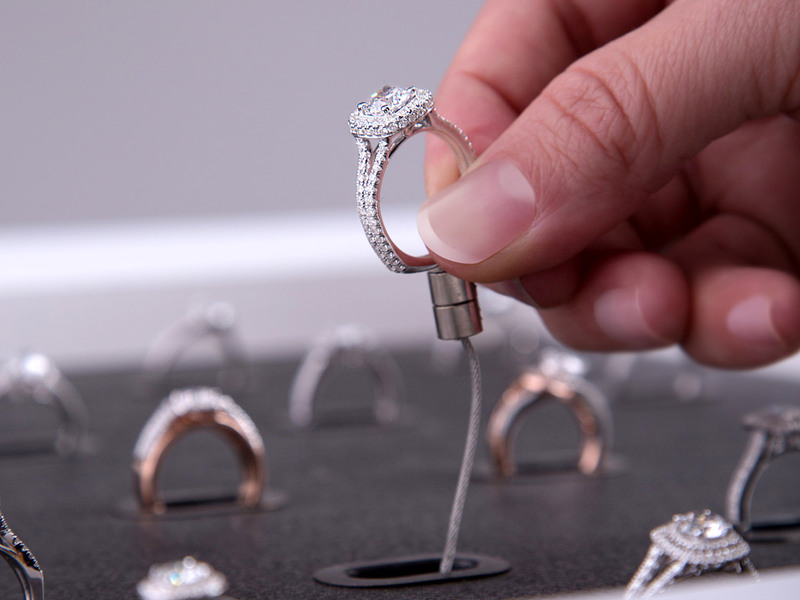 When it comes to shopping for that once in a lifetime ring, however, bridal shoppers really haven’t changed—they still want a unique experience, one that is memorable, personal and meaningful. So how do you connect to your ideal customer in a way that’s relevant to them and still provide them with that special experience they so badly want? The Naledi SmartKiosk is an innovative and highly effective solution to this problem. When paired with the RingFinder App for iPad and iPhone, it dramatically increases your visibility and helps you market your target audience in a way that is attractive and makes imminent sense to them. And because it’s located right there in your store, it’s easy to give them that special ring buying experience. We have had the IGC Kiosk, nearly 3 years. We absolutely love it. We probably have sold 30 -40 rings in 3 years as a result of the Kiosk. Very comprehensive program, IGC is great to work with. My #1 supplier. It’s like moths drawn to light at bridal shows. This kiosk leaves a great impression with millennials. It’s like moths drawn to light at bridal shows. Brides, their friends, moms, etc try on rings & use the IPad. The iPad makes it easy to price, even they can price it out for themselves. There are several rings that sell over and over. Sam & Chris are great to work with. 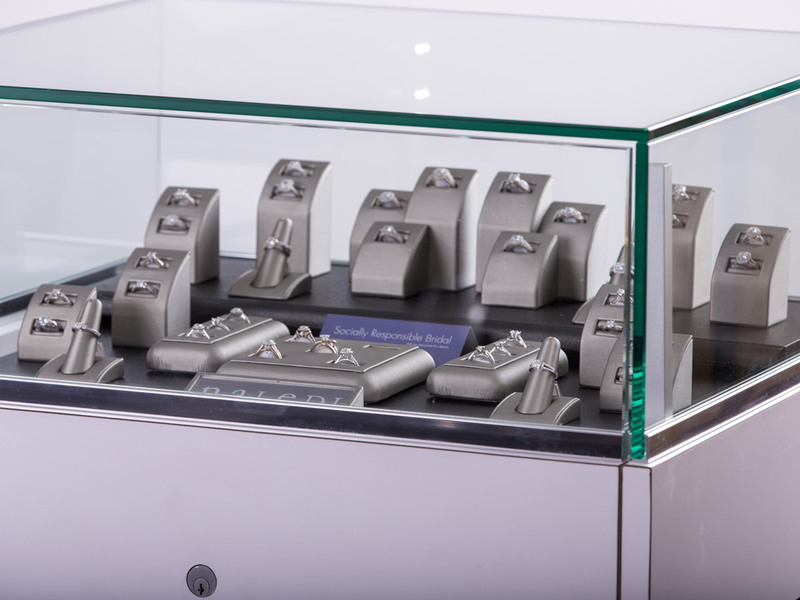 The Naledi Collection Smart Bridal Kiosk is an engagement ring display, integrated with the Naledi RingFinder App, that allows customers to research and try on rings in your store unassisted. It allows customers to research the entire Naledi Collection in one place, to try styles on right there in your store, and to instantly share their favorites with family and friends. 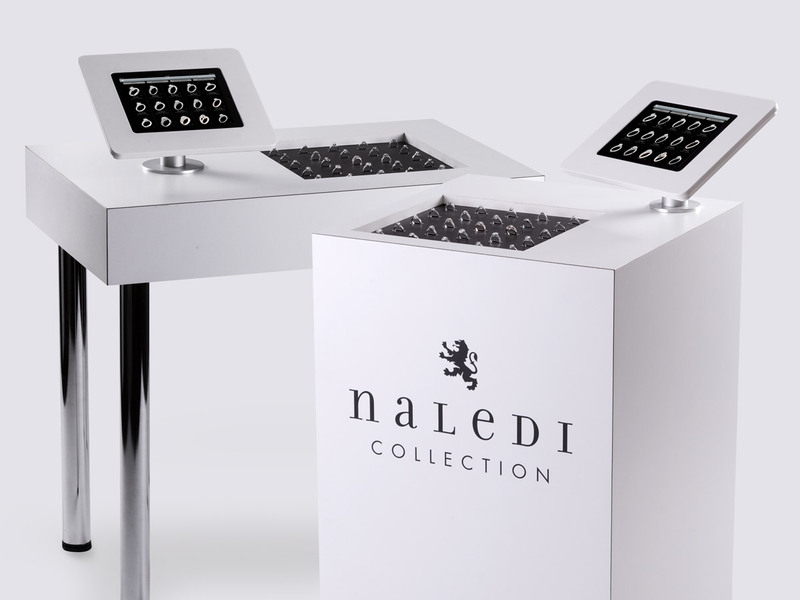 It would take a 28 foot showcase to display The Naledi Bridal Collection; the smart kiosk condenses it to as little as 2 feet. Price changes, discontinued items & new releases are updated automatically over the Internet & unlike websites, the system is completely maintenance free. The Smart Kiosk provides associates with instant access to all the information they need to make better sales presentations. Millennials are cautious when it comes to spending money & they need constant re-assurance that they are doing the “right” thing. The Smart Kiosk helps close these customers by making it easy to share the diamonds & settings they are interested in so they get the assurance they need to buy. Size options to fit your needs. The Naledi Smart Kiosk is available in three different designs so that you can choose the perfect fit for your specific needs. A Small Kiosk, Podium Kiosk, and Table Top Kiosk. 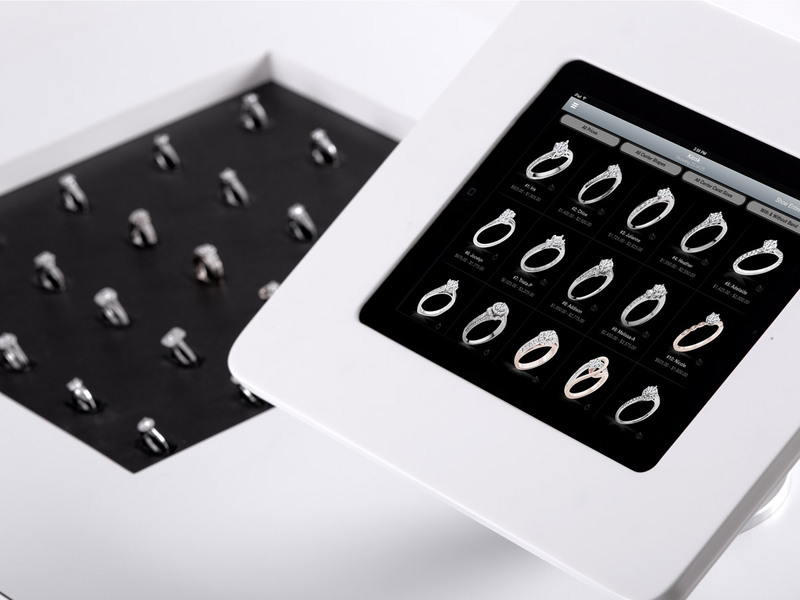 Each kiosk comes with 25 tethered rings, an iPad display, and multiple configurations, with or without traditional display case. It’s available on lease-to-own finance plans starting at $225. a month. The Naledi Smart Kiosk offers a safe and affordable way to increase your sales and visibility without increasing inventory or staff. It requires little supervision, is easy to set up, and has up-to-the date pricing and info. And because it uses sales prototypes, you don’t have to stock unwanted inventory in your store. In fact, Naledi’s efficient purchasing program—including prototypes, generous stock balancing, and 24-hour delivery on reorders—makes it possible for you to achieve inventory turn rates usually associated with purely internet retailers.